Crossbreed Holsters routinely mesh leather and Kydex for a hybrid style aimed at providing comfort and security. The company’s latest holster, the Reckoning, comes with a lofty name and the promise of more functionality for concealed carriers, but does the rig actually live up to its hype? Guns.com nabbed a Reckoning holster to find out. 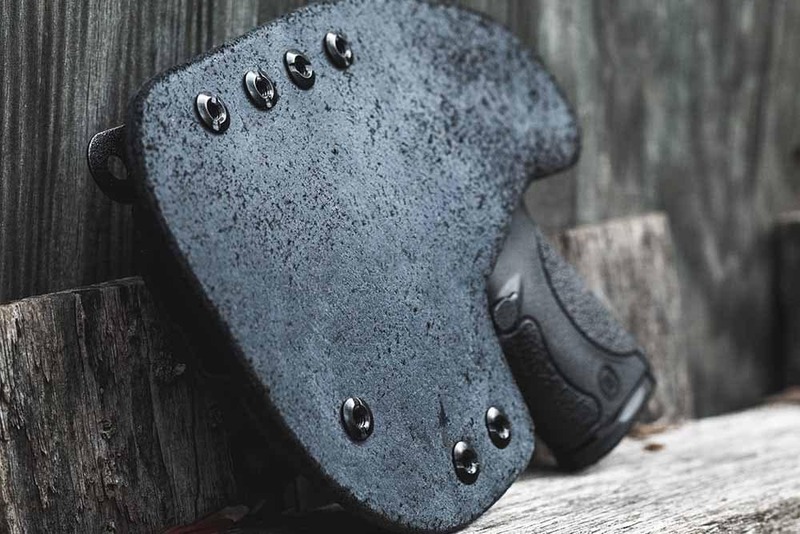 The Reckoning keeps to Crossbreed’s hybrid holster design, featuring a Kydex shell mounted to a leather backing, while also bringing more modularity to the Crossbreed brand. Though appearing to be a standard inside-the-waistband holster, the Reckoning is not all that it seems. In fact, Crossbreed attempts to appease consumers looking to bridge the gap between outside-the-waistband and IWB. The Reckoning, with a few swaps of hardware, converts from an IWB rig into an OWB. 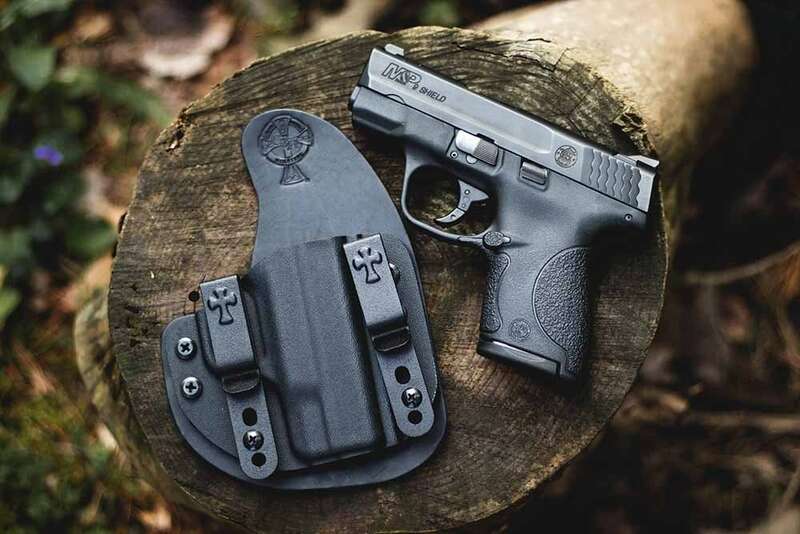 The holster shell itself falls to Crossbreed’s renowned design, offering a Kydex shell with a retention system designed to secure the gun in the holster. Featuring retention adjustments via Chicago screws, the system allows users to dial retention to their liking. The Kydex rests on a leather backing that comes in a few options to further customization. Standard configuration offers a black cowhide leather while upgrades include horsehide or Founder’s vegetable-tanned leather. The Reckoning, a relatively new holster, is still growing in terms of offered gun models. Currently CZ, Glock, Ruger, Sig, Smith & Wesson, Springfield Armory, Walther and most 1911s are covered but the company says more models are in the works. The first step in readying the Reckoning is deciding on IWB or OWB clips. Since I prefer IWB carry, I opted for the appropriate IWB belt configuration. Luckily, the holster ships in IWB so there were no added steps on my part. Next, I set about adjusting the retention. The Reckoning sent to me was outfitted for the Smith & Wesson Shield in 9mm. Upon sliding the gun in the holster, I found the fit a little too tight for my liking. Therefore, it needed a tune-up. To adjust retention, an Allen Wrench and few turns is all that’s needed. Since my holster was too tight, I rotated the wrench a half turn to the left to loosen. Inserting the gun back into the holster I found the retention now too loose. Back to the Allen Wrench and a quarter turn to the right to tighter the rig back up. Another insertion of the gun proved perfect and the Reckoning was good to go. The Reckoning in IWB configuration rests anywhere the wearer desires. For this review, I tested it out in both the four-o’clock position IWB position and AIWB. Crossbreed prides itself on comfort of wear and the holster delivers. The leather backing offered a comfortable feel against the skin, requiring no undershirt with my outfit. As time progressed, the leather broke in becoming even softer and molding better against my skin. While this added comfort, wearers do need to keep in mind that after significant wear leather can begin to warp. Granted, this takes time, but users should get in the habit of checking holsters with each wear to ensure significant wear doesn’t impact concealed carry. The Kydex shell features a sturdy design that, when paired with the adjustable retention settings, grips onto the wearer’s gun. For this review, I opted for the Smith & Wesson Shield. The Reckoning had no issues keeping the gun in place. I moved, I ran, I went about my normal day-to-day activities while the Shield rested securely in my waistband. Having the ability to adjust retention to my desired level proves handy as it allows concealed carriers to really dial into their sweet spot as far as retention goes. With each draw, I knew exactly how much oomph was needed to remove the Shield and exactly how much pressure was required to re-holster. Despite the Kydex shell adequately covering the trigger area and its retention settings kept the gun secure, I did find the shell’s edges to be a tad sharp. In fact, I sliced my finger while adjusting retention settings upon first use. Though by no means a catastrophe, it is something to be wary of and careful when handling. My first go with the Reckoning came in the form of AIWB. A regular carry spot, I placed the Reckoning in the appendix position, inside my waistband to determine whether this would be a viable option for me. I had my suspicions that AIWB might not work as well, simply for the fact that the holster does not offer a claw, wing or wedge which often proves useful to AIWB. My suspicions were confirmed. While the holster and Shield would work with looser outfits of mine, t-shirts were out of the question as the grip rested too far from my body and therefore printed. Now, this isn’t a complete deal breaker. A shoe insert and some Velcro added to the leather backing works as a budget, DIY wedge set-up; but this is added work. Off the rig came in AIWB and into standard IWB it went. Here, I found the Reckoning shined. In the four-o’clock position it better molded into my body. I still found that occasionally the Shield poked through, but it was more inconspicuous and with a purse on my shoulder would be completely unnoticeable. Again, the leather backing helped increase comfort allowing me to wear the rig all day with no discomfort or adjustments. All in all, Crossbreed kept to its promise of security and comfort with the Reckoning. While it didn’t quite work for me in AIWB, it proved workable in standard IWB configuration. Priced at $69.95, the Reckoning offers adjustable retention and a versatile OWB/IWB configuration.